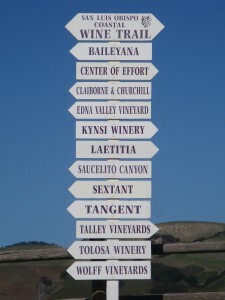 Halfway between San Francisco and Los Angeles, the San Luis Obispo (SLO) Wine region runs from the Santa Lucia Mountain Range down to the Pacific Ocean, with over 25 wineries near the cities of San Luis Obispo, Pismo Beach, Avila Beach, and Arroyo Grande. This is also the home of the Edna Valley and Arroyo Grande AVAs. The marine influences of the Pacific Ocean result in cool summers and warm autumns here, so the growing season is a long one. 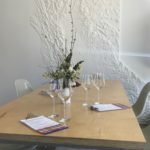 Visitors to this area can easily ride a bike through the rolling hills of wine country, lay out on a white sand beach, and taste some fabulous wine all in the same day if they wish. The Giant Grinder Shop – Brad Fuller, creator of the original Giant Grinder in Long Beach, now operates a second outlet in San Luis Obispo with his wife Sherri. Pay attention to the name here because these delicious sandwiches made with fresh local ingredients start at 9” and just go from there. There’s a choice of rolls here and you can select among Cold (Roast Beef, Black Forest Ham, Smoked Turkey, Veggie, etc. ), Hot (Meatball, Sausage, Pastrami, etc.) and Signature Combos such as Chicken Breast & Prosciutto or the East Coast Combo with Mortadella, Italian Salami and Capicolla. There are also a handful of Green Salads including a Chef’s Salad and Chicken Caesar Salad. 1901 Broad Street, San Luis Obispo (805) 543-6700. SLO Wine Country – The San Luis Obispo Wine Country Association is a non-profit organization promoting local wineries and vineyards. Major events sponsored each year are the Roll Out The Barrels Weekend (in June) and Harvest Celebration Weekend (in November).